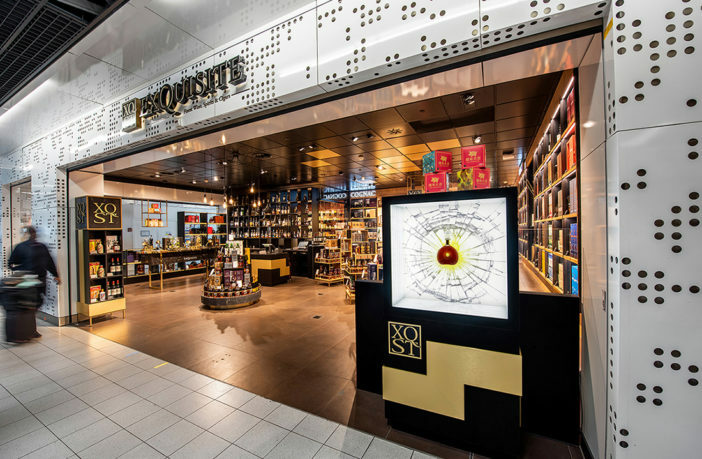 Schiphol Airport Retail, a joint venture between Gebr Heinemann and Royal Schiphol Group, has unveiled its new-look Exquisite Shop at Amsterdam Airport Schiphol, Netherlands. The ambitious design of the 136m² (1,460ft²) retail area is intended to boost the Exquisite Shop as a unique destination for the finest wine, spirits and cigars, taking the connoisseur’s travel and shopping experience at Schiphol to the next level. The new shop preserves a sense of the original classic design, but instead of an all-black wood interior and heavy leather armchairs, it now presents a more modern interpretation of the classic aesthetic. A palette of neutral and earthen tones creates a warm and welcoming atmosphere, while copper and brass design elements build a contrast and set eye-catching accents. With new furniture, signage and an open façade, the Exquisite Shop boasts a much lighter urban design, intended to appeal to a younger target group. The redesign was accompanied by a renaming of the shop to Exquisite, Finest Wine, Spirits & Cigars. Besides its completely fresh design concept, the new Exquisite Shop offers a special attraction: the aroma table. It is made of marble and brass and features five trumpet-like devices that, with the squeeze of a rubber bulb, release the delicious aroma of a core taste of the wine or spirit it promotes. “The aroma table aims at changing customers’ perception of a product by highlighting their unique flavors rather than arranging them by specific category or brand,” added Asmus. “It allows us to engage in a completely different way with our customers and let them discover their preferences in a new, much more emotional way.